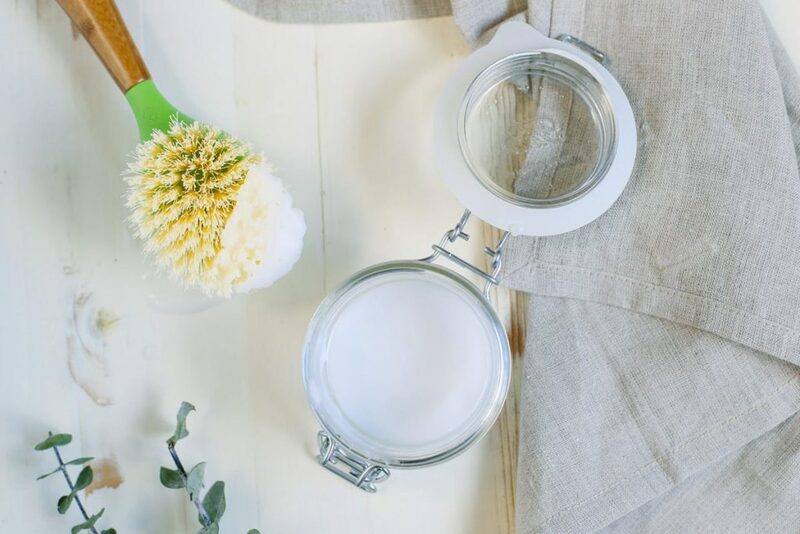 I wish I could tell you that by using homemade cleaners you’ll never have to scrub a toilet or wipe a dirty wall ever again. 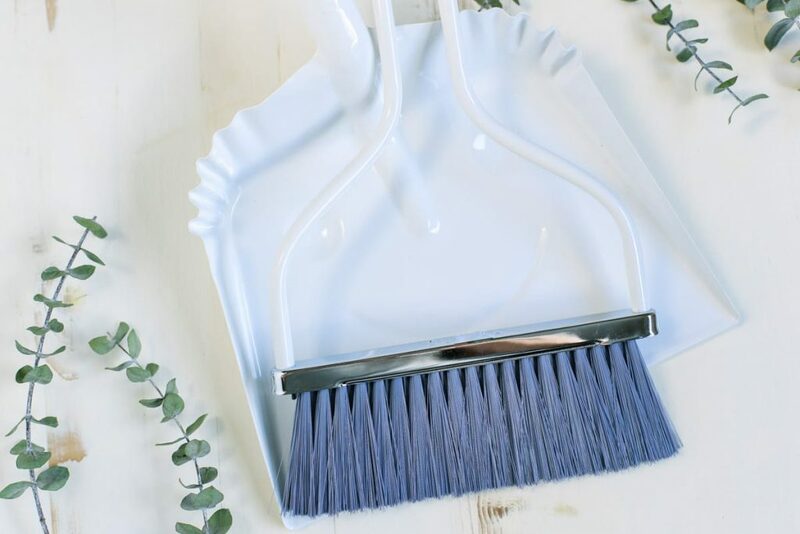 While homemade cleaners are super effective, when mixed and applied properly, they are just like store-bought cleaners in one particular way: a cleaner is only as good as its partner, the cleaning tool. The good news is that you don’t need to purchase any special tools once you make the choice to switch out the Fabuloso with a homemade all-purpose spray. You can keep the same cleaning tools! 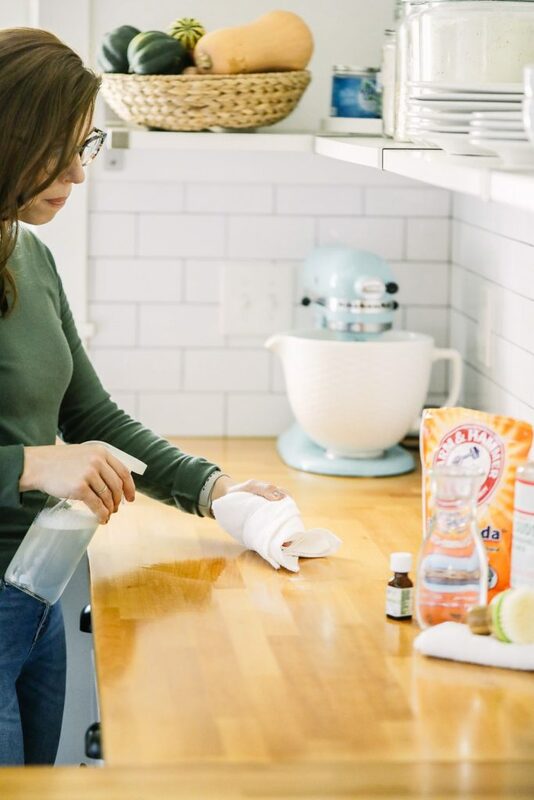 “Many hands make light work.” Think of your cleaning tools as the many hands when paired with your favorite, natural cleaners. Note: You’ll find more than 10 tools on this list. Some tools are optional since they may not apply to every home. 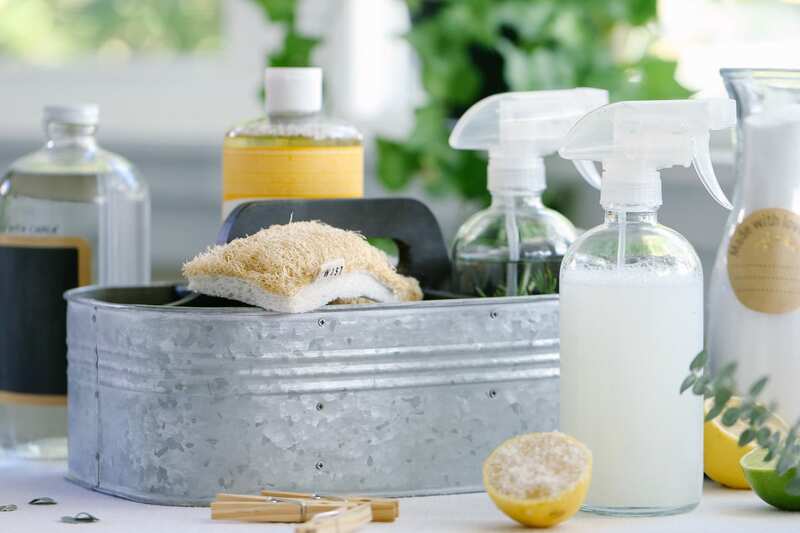 No job is too tough for a good scrub brush and a bit of homemade scrub cleaner or all-purpose spray. Go ahead, Dirt, give us your best shot! I prefer to keep a short handle scrub brush for the dishes and sink jobs, and a long handle brush for bathroom tile and grout cleaning. A toothbrush, reserved for cleaning purposes, is also handy for cleaning bathroom tile grout and hard to reach sink areas. Towels are essential in a cleaning toolkit. 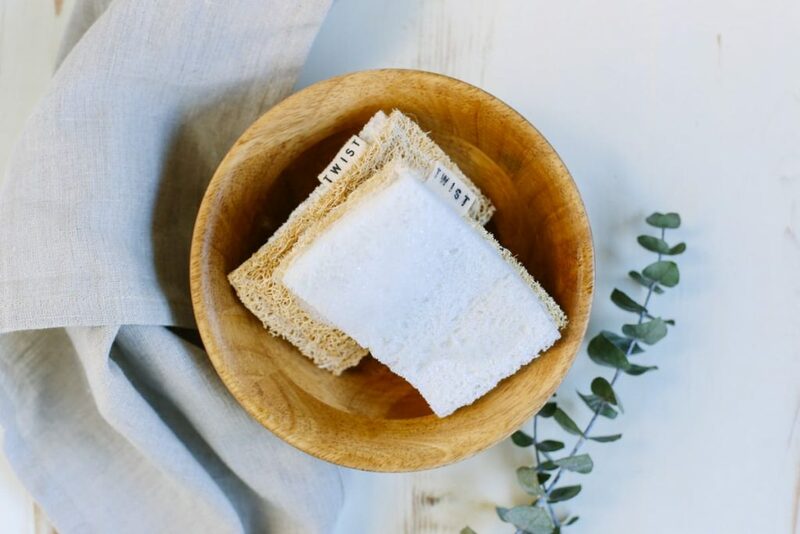 I prefer to purchase cotton washcloths or small dish towels since both are the perfect size and come in various colors (who said cleaning must be boring??). 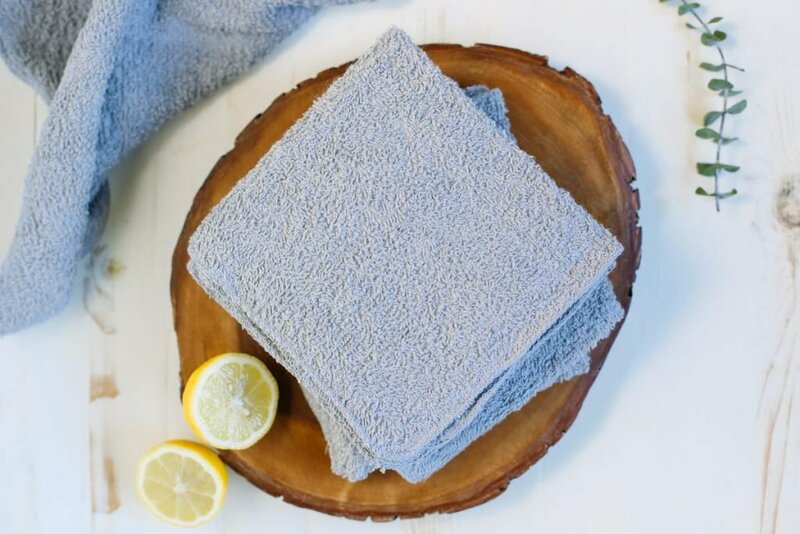 When purchasing towels, to keep in your cleaning toolkit, look for towels that are easy to handle and will endure the test of time and the washing machine. 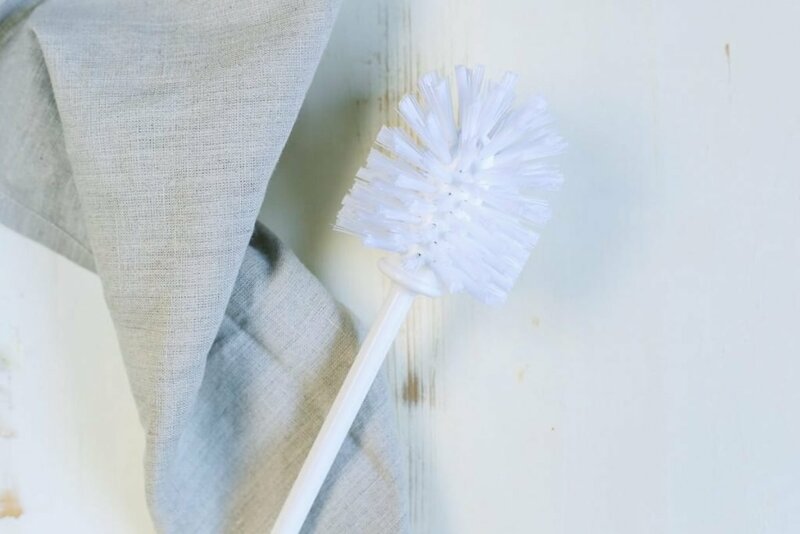 I use towels for wiping surfaces (after spraying a surface with my surface cleaner), as homemade Swiffer-like wipes, and/or to create reusable surface cleaner wipes. A microfiber cleaning cloth is a blend of polyester or polyester and nylon. This cloth is usually super soft. According to an article by UC Davis, regarding a hospital that switched over to microfiber cloths and mops, “…microfiber mops did a better job of penetrating surface pores and removing dust particles than conventional string mops and cloth. For example, after a surface was cleaned with conventional tools, a bacteria culture showed a 30-percent reduction, while microfiber materials reduced bacteria by 99 percent.” (source) That’s quite significant! Microfiber cloths can be pricey, but they wash incredibly well and last a long time. Plus, they don’t leave behind lint and streaks like their cotton counterparts. 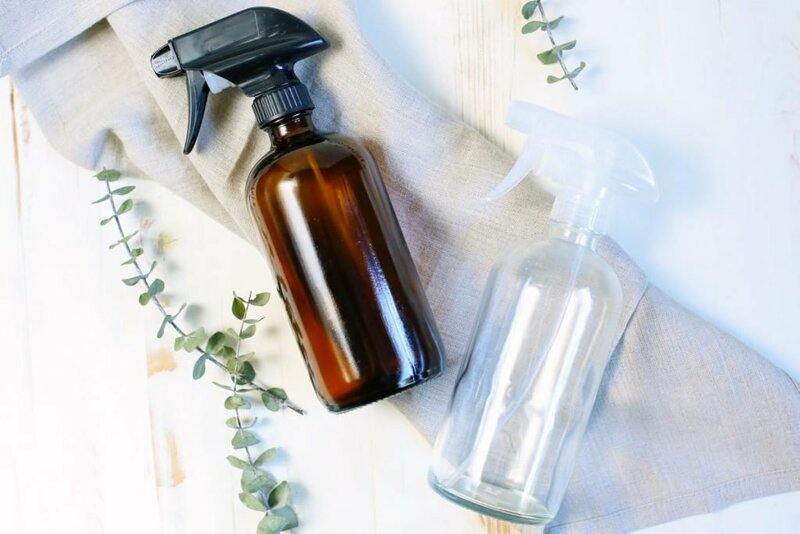 In order to make homemade spray cleaners you’re going to need spray bottles. 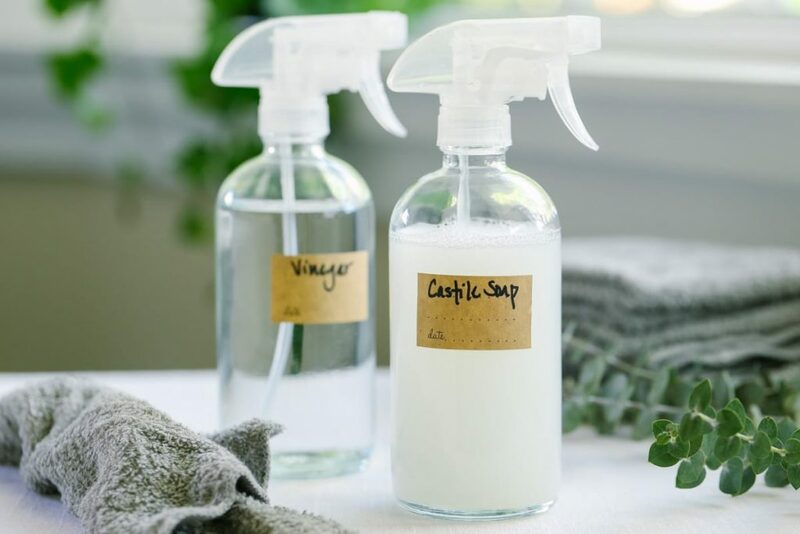 There are several options when sourcing spray bottles for homemade cleaners: 1) repurpose old surface cleaner bottles; just make sure you wash the bottles out thoroughly; 2) make your own cleaner bottles from vinegar bottles (small Perrier water bottles also work! ); 3) purchase ready-to-go cleaner bottles. 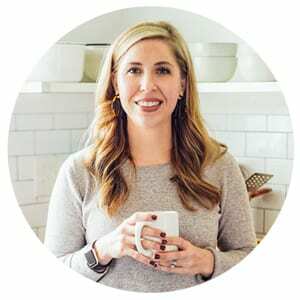 Once you begin to stock your natural ingredient stash (remember my twelve must-have cleaning ingredients? ), it’s time to source a few storage containers to hold leftover ingredients. I find most of my storage jars in the kitchen aisles at Target or HomeGoods. 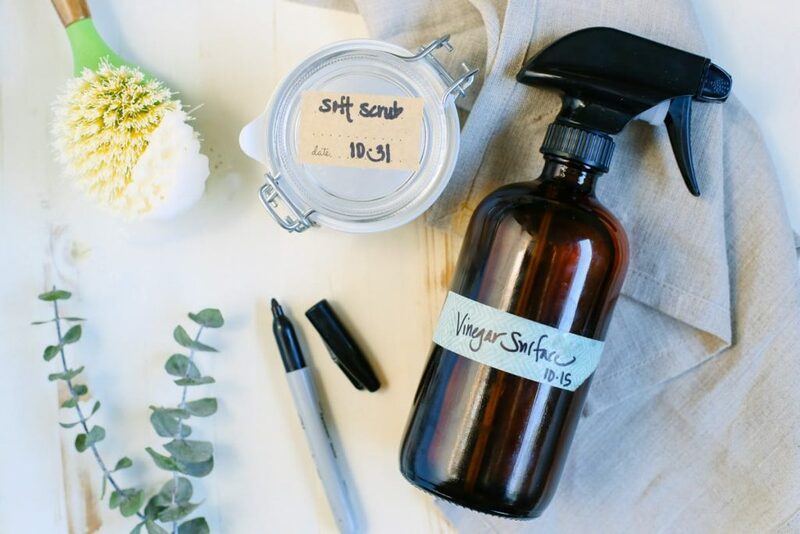 Not only will you need to store leftover ingredients like washing soda or baking soda in storage containers, you’ll also want to keep a few smaller jars with lids around for homemade products that aren’t stored in a spray bottle: carpet deodorizer, scrub cleaner, toilet bowl cleaner powder (coming November 23rd in the new book), reusable surface wipes, and homemade Swiffer-like wipes. I purchase my smaller jars from Target, Amazon, craft stores, and even the grocery store. Mason or Weck jars also make excellent storage containers for both ingredients and final products. If you plan to make homemade hand soap or dish soap, you’re going to need a soap dispenser. Soap dispensers can be found in the bathroom section of most home stores (Target, Walmart, HomeGoods, etc.). Sponges are great for cleaning dishes, of course, as well as scrubbing or wiping surfaces. I really like a sponge with two surfaces: one for wiping and one for scrubbing stubborn surfaces. Any sponge will work for cleaning. I personally like Twist brand sponges. A good dusting wand is your best companion when it comes to tackling dust-loving fans, surfaces, and walls. I highly recommend purchasing a dusting wand with a removable and washable duster. 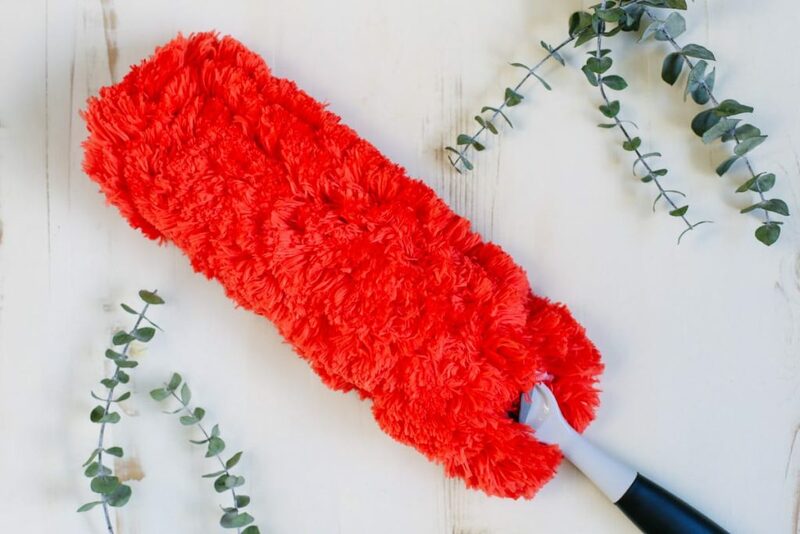 My favorite dusting wand is the OXO Microfiber Hand Duster. My broom is put to use, between kids and dogs, at least every other day. 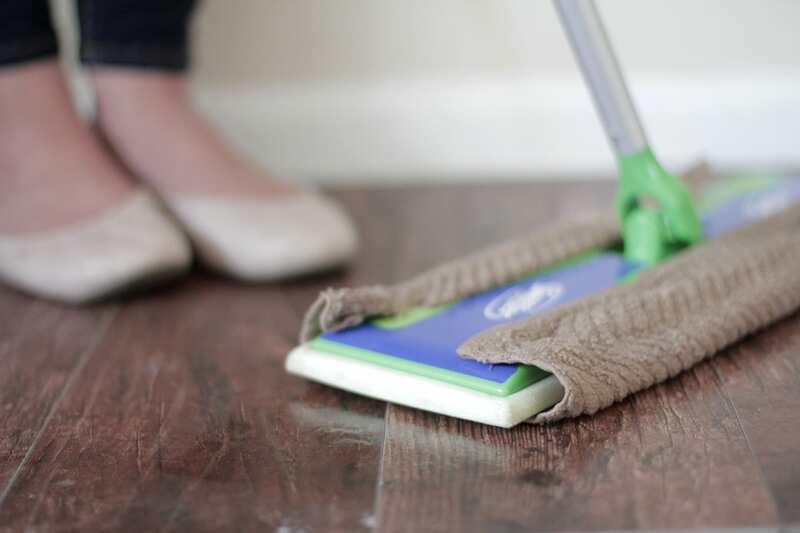 If you have any hard floors in your home, a broom and dustpan are must-have tools. I also use my broom for brushing off our couch every few days. 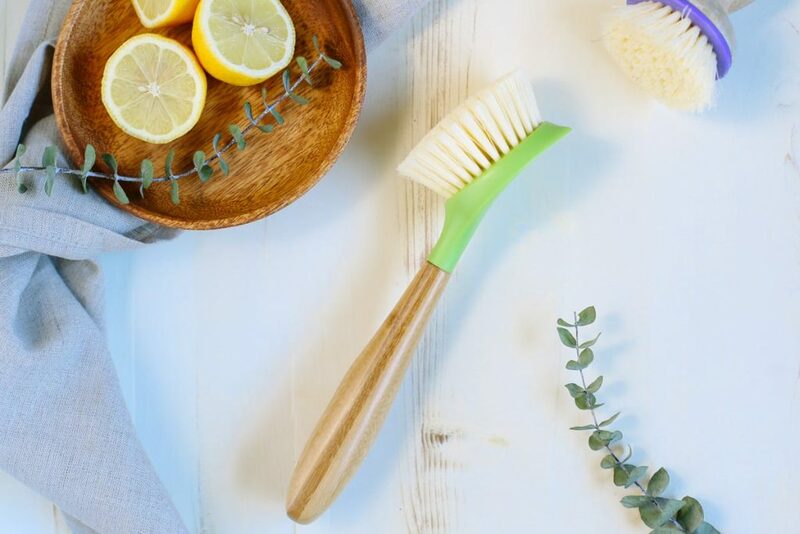 This tool is so important, but often overlooked when making the switch to homemade cleaning products. Trust me, I’ve learned the hard way that labeling everything you make is important. While most homemade products are safe to use in multiple ways, you don’t want to grab the stain remover only to realize you meant to grab the castile soap surface cleaner. Labels not only tell you exactly what a cleaner is, but also when you made it. Most homemade cleaners will last for months, but it’s always good to know the made-on date for future reference. Finally, labels are just pretty! A pretty label adds that extra sparkle to a spray bottle or homemade scrub container. You don’t have to purchase speciality labels to get the pretty look, a roll of Washi tape also does the trick. Keep in mind that bottles and containers often get wet, so your label may need to be replaced in the future–you don’t want to work so hard on a pretty label and later feel like that effort was in vain. Note: I’ve labeled this tool as optional because you don’t need fancy labels to make homemade cleaners; you simply need to label your bottles in some way. If you don’t want to hunt for labels or purchase special tape, simply use a permanent marker on your glass bottles. The permanent marker can be scrubbed off once you’re done with the cleaner inside. Next up, gloves! 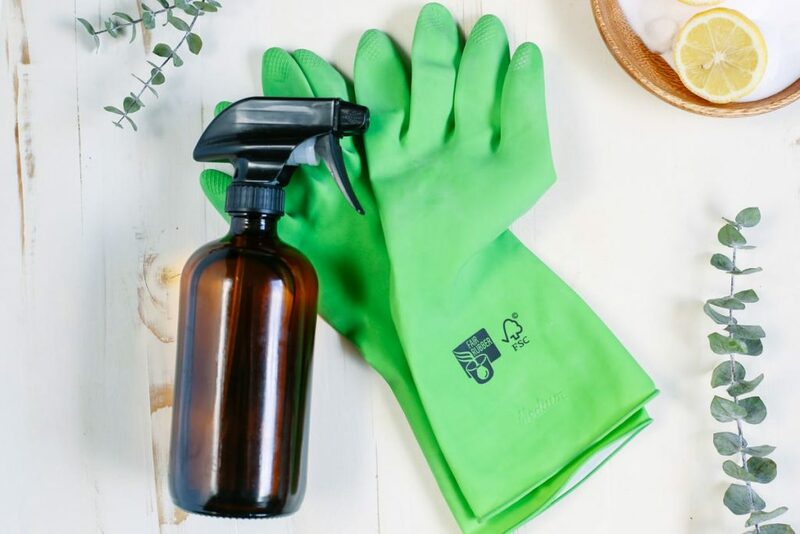 Usually gloves are worn for cleaning to protect the skin from harsh chemicals, but when it comes to making products at home, we aren’t dealing with harsh chemicals. So why use gloves? Gloves are more of a personal preference than a must-have for homemade cleaning. Our bathroom tile is known to attract mold and mildew (due to poor ventilation in a small space), so I use my homemade mold and mildew spray and/or my scrub cleaner to tackle the nasty invaders. I prefer to wear gloves to protect my hands from the scrubbing action and mold/mildew. I like the If You Care brand of rubber gloves in size medium, but any brand of gloves will work for cleaning. Everyone needs a toilet brush, right?! Find one that you love and keep it handy for this dirty job. I use a homemade liquid toilet cleaner or powder cleaner with a toilet brush to achieve fresh, clean toilets. Okay, enough said on that topic. I’ve been through a lot of vacuums over the years, from cheap Target specials to higher-end brand names. While I think a good vacuum is definitely an investment worth making, I also believe the big difference between a vacuum that does an okay job and one that outperforms your wildest expectations, boils down to care. Take care of your vacuum by cleaning the inside canister, cleaning the filter, and replacing the bag often (if the vacuum uses a bag). If you take care of your vacuum, your vacuum will take care of you! 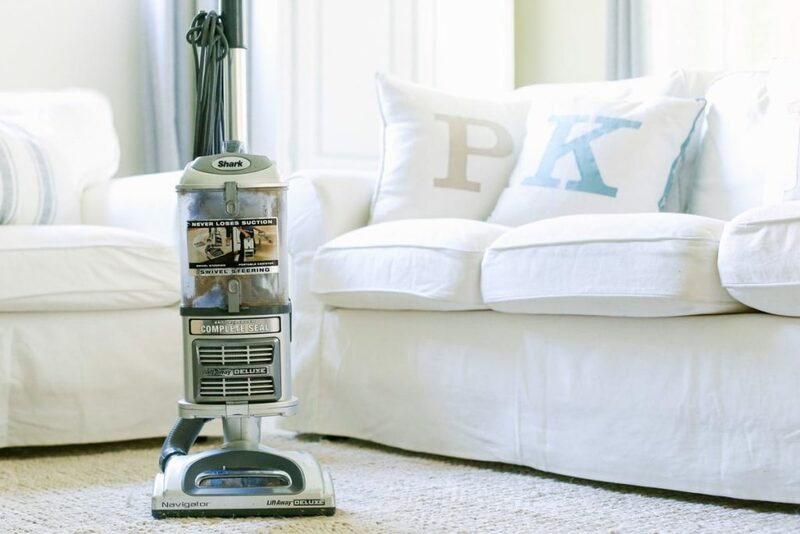 Even if you don’t have carpet, I believe a vacuum is still important for cleaning upholstered furniture. If you want to go down the Swiffer route, you’ll love my homemade Swiffer-like wipes. Buy the Swiffer, just avoid the heavily-perfumed disposable Swiffer wipes. If a mop is your choice, then you’ll also need a bucket so you can mix up a floor cleaner. Here’s my recipe: 1 gallon hot water + ¼ cup borax + 2 cups vinegar + 30 drops cleaning essential oil. Note: I’ve listed a mop or Swiffer as optional, since some people may not have enough hard floor surfaces in their home to justify keeping such a large tool around. If you only have a small bathroom and/or kitchen with hard floors, then a towel and sink, or just a spray floor cleaner, will probably suffice. A funnel is an invaluable tool for a DIYer. A funnel allows you to successfully transfer your prized homemade cleaner from the mixing container/bowl to a storage jar or spray bottle. A few months ago I purchased a silicone funnel and absolutely love it! 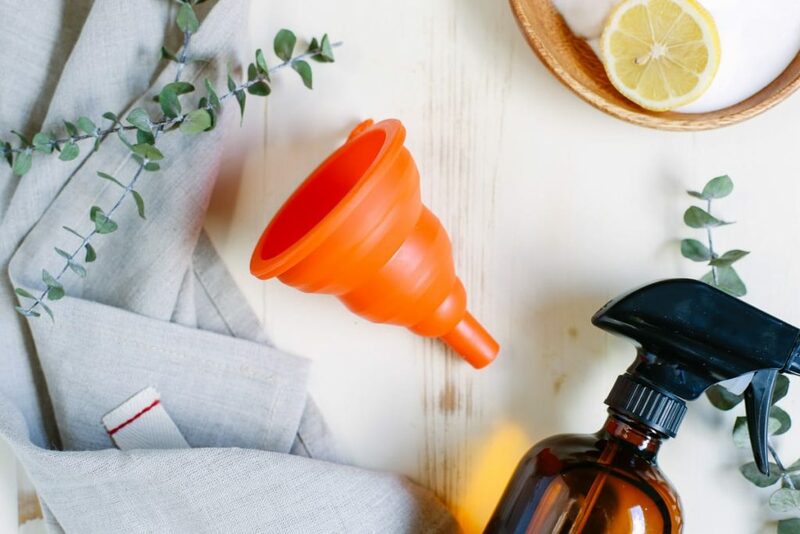 A silicone funnel is easy to use and collapses for easy storage. I’ve found that keeping all my cleaning products in one central location keeps me organized and less frazzled when it comes time to clean. A cleaning caddy or box can be as fancy or as boring (for lack of a better term) as you’d like. The idea is having a central location to keep your tools and basic cleaners organized. Most of my homemade recipes require measuring ingredients. 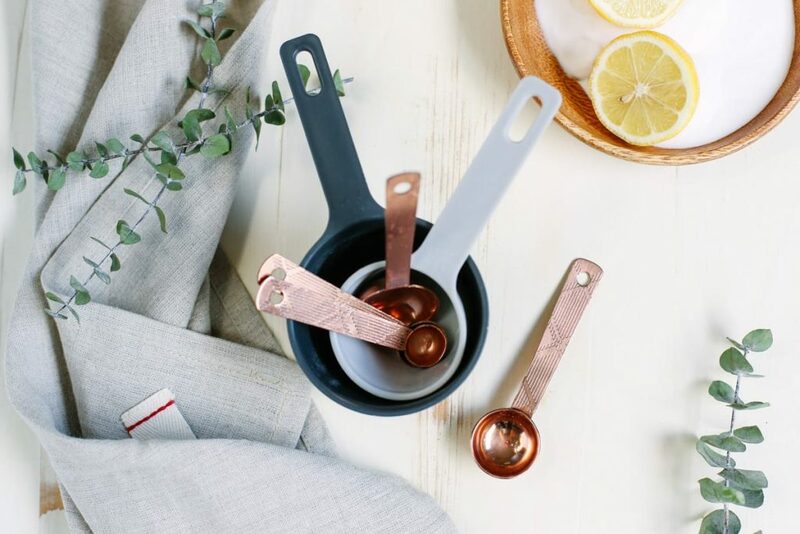 Since the ingredients used to make homemade cleaning products are safe ingredients, I don’t use a special set of measuring cups or spoons to make cleaning recipes. This post is great, I wish I could’ve read it when I was setting up house . I bought a big package of microfiber towels at Costco a while back for a great deal. I use them to replace paper towels. They work especially well on mirrors and to buff faucets and other metal surfaces. They are great for dusting since they attract the dirt when rubbed and all staticy. I also use them to dry the car after its been washed, and to soak up spills and such. I highly recommend them. I use far less paper towels now. In fact, I have half the same roll I bought two months ago! Thank you, Bethany. The microfiber cloths really are amazing! 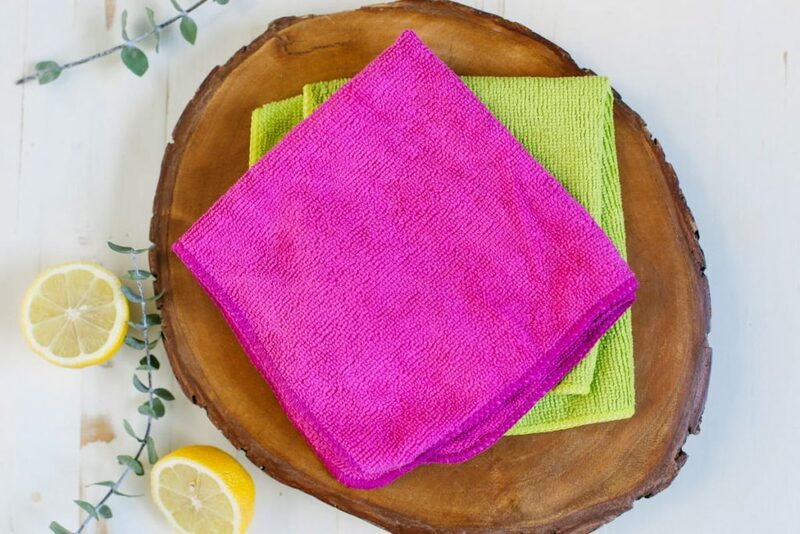 I love that you replaced paper towels with the microfiber cloths–such a great use for them!! What a fantastic website. So glad I found it! Thank you. I was tired of trying to get grout, the flat shower walls, and the integral soap holder grooves clean from soap scum. I’d steam,spray bleach but was never quite satisfied with results. ( and not happy with chemicals). No problem now though as I hit on the idea of actually using a toilet cleaning brush for this job. I bought mine at ikea, very cheap,but you could probably get the same at a dollar store. The brush head is very firm and the handle a comfortable length. I’m sure with your recipes I’ll now be able to get the (safe) level of cleanliness I want. Incidentally, on the same theme, for those with dogs, I bought a bunch of the brushes and using duct tape attached them to a broom handle. Now, I slosh our paved yard with some concrete cleaner, hose with water,and then scrub,rinse again and the yard is clean from the deposits from our woman’s best friend ? Awesome, Fran! Thank you for sharing! Just a tip, if you’re going to buy spray bottles, just get them from the dollar store. A spray bottle is a spray bottle, and even at Walmart you’re going to pay like $5 for a bottle when you could get them for $1 at Dollar Tree. Hey Mia, I’m so glad you’ve found spray bottles that work great for you. I personally love my glass spray bottles, which are totally worth the price in the long-term. Hello Kristin. I am not sure if you coverd this in another post, but I am wondering what kind of mop do you use? I’ve recently spent over $70 on two different kind of mops and I am not very pleased with them. Thanks! Hey Ioana, My mop is from Casabella. I believe it’s this one: http://casabella.com/wayclean-magnet-mop-3/. Your broom is so pretty!!! Where can I find it? Thank you. I purchased the white broom from HomeGoods. Just have to comment and say we swear by Shark. LOVE THEIR VACCUUMS! I love how you work to make everything so easy to follow and easy to do. You think of every detail to make sure someone is set up for success! Thanks! 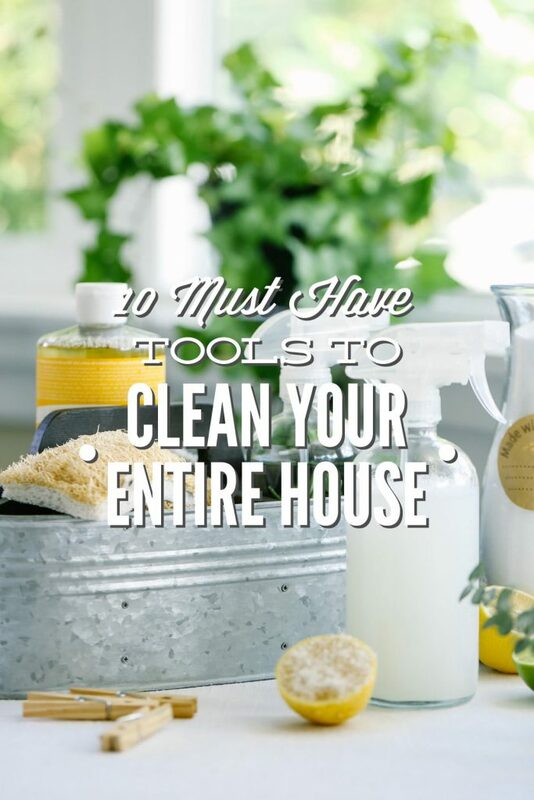 These 10 tools are so important to clean the house, but I think we should use them inside. Are there any tools that we could use for the outside like: pillars, doors, wall, etc.? Hey Micheal, I’m not sure what you’d need to heavily clean the outside of your home–it’s not something we focus on.